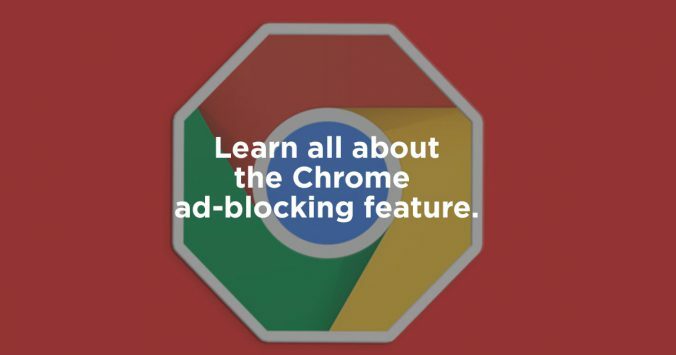 Google has just confirmed the launch of the ad-blocking feature on Chrome, which was announced more than a year ago. What will be the specific scope of this ad-blocking function? We shall tell you everything in this article. Chrome prefers to talk about filtering ads rather than blocking pure and hard. Unlike other ad-blockers (such as the one we integrate in URBrowser), chrome bases its intervention on the screening of advertising formats considered intrusive by the Coalition for Better Ads (CBA). On a mobile phone, Chrome targets 8 different formats, as shown in the illustration below. These are essentially the most intrusive formats. If a site is caught in flagrante delicto of excessive use of these formats, it risks the full blocking of its advertisements by Chrome. The filtering of Chrome starts with the evaluation of the site, based on the quality of the advertisements it broadcasts (cf criteria above), according to 3 levels: success, warning, failure. When a site is the subject of a warning, it is invited to correct the shooting and re-submit its site for evaluation. When a site is classified as a “failure”, it has 30 days to modify itself. He must resubmit his site. Full blocking of ads becomes effective after a 30-day grace period. As soon as the filtering / blocking starts, it operates for a minimum of thirty consecutive days, before a possible revision of Google’s position, at the express request of the targeted site. Google will keep on its servers a list of sites in default, which will be used as a basis for its filtering, in addition to the EasyList service, also used by most other ad-blockers. If Chrome blocks ads on a page, the visitor will be notified by a message and will have the option to disable the blocking. How many sites are impacted? Google encourages the implementation of this blocking system based on pre-filtering by its desire to contribute to improving the quality of advertising formats, the excesses of unscrupulous stakeholders negatively impacting the entire ecosystem. Google has announced that based on its pre-filtering only 1.5% of 100,000 sites analysed would currently be the subject of a “warning”. Only 0.9% of these sites would broadcast an excessive amount of intrusive formats and would be likely see all of their advertisements blocked. 14 sites out of 100,000. We are far from the hecatomb dreaded by many stakeholders in the adtech. The CBA has announced that a “certification” program would allow sites that use it to be immune to Google Chrome filtering. The contours (and the final price) of this certification are not yet very clear. If you want to completely block ads on the sites you visit, we invite you to discover the features offered by URBrowser. Remember that beyond the performance aspect, the display of advertisements may involve other risks, including the execution of malicious codes.